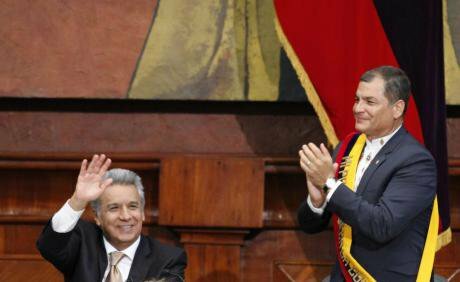 Lenin Moreno, left, was inaugurated as the new President of Ecuador in the Plenum of the National Assembly, former President Rafael Correa, right welcomes him, in Quito, Wednesday, May 24, 2017. Photo by Gabriela Mena/ACG/SIPA USA/PA Images. All rights reserved. When I think about Rafael Correa, and I suppose that in Ecuador we all do more often than is good for us, the image that comes to mind is that of a bull. A bull: strong, fierce and tireless, capable of a great deal of work. The problem of course is that bulls can also be dangerous and destructive; get too close to a big animal in a small space and you’re likely to get hurt. Ecuador is a small space, and a lot of people have been hurt over the last ten years by Correa’s bull headed attitude to getting things done. To be fair, he did get a lot of things done. For the outside observer it’s obvious that the country has changed, and not only on the infrastructure level. Correa gave Ecuadorians political stability after a tumultuous period of seven Presidents in ten years, and a sense of pride that they had never witnessed before, with the possible exception of a military victory over Peru in the border war of 1995. And after the economic disaster of the early century, when poverty levels briefly rose above fifty percent (50%) and it seemed that half the population was migrating, or at the very least considering it, this was nothing short of astounding. He put them on the map. Calling Moreno weak is nothing more than arrogance. But to get back to the negatives. I confess to admiring those blessed with the spirit and energy to create, while recognizing that the ability to ‘get things done’ is often accompanied by a desire (presented as need) to trample on the unfortunate sods that happen to get in the way. And this coupled with a vicious attitude towards political opponents who try to derail the ‘project’. Many in both categories have felt the bull’s hot breath down their necks over the last ten years. As a consequence the governing party’s candidate in the last presidential elections, Lenin Moreno, barely scraped over the line, and did so principally because he was not Rafael Correa. He promised a different style of government. And after the first two months we can clearly say that we have exactly that. Strangely, that has made a lot of people within the governing Alianza País unhappy. Moreno has been called a traitor, weak, a liar, a neoliberal, a sellout to the Right, and all this by those who are his own side, including the ex-president himself. Correa has actively gone after his successor, taking a leaf out of Donald Trump’s book, twittering on a daily basis and causing a great deal of damage by blundering about in his own china shop. Why? The basic reason has little to do with ideology, although that’s how it’s been dressed up by many of the members of the Ancien Regime. Calling Moreno a traitor to the project requires defining the project, which could be difficult given that a major feature of Correa’s government has been pragmatism. Calling Moreno a neoliberal is to forget what neoliberalism is, to forget that the Free Trade Agreement with the EU was signed by Correa (it was probably inevitable), that Correa himself leased oil fields, and proposed selling off hydro-electric installations (long lease), and selling the nationalized Banco del Pacífico as well as the National Airline, Tame, which would be a blessing if in fact it were possible to find a buyer at a price over US$100. Calling Moreno weak is nothing more than arrogance. The economy is also not in great shape, and lowish oil prices mean that the government no longer has the ability to stoke the economic boiler. Moreno might have been more careful about some of his ministerial appointments, naming people that he knew, or should have known, were going to be a problem for many of his party members. On the other hand, real changes to previous government policies are likely to be few. It’s been evident for some time that major cooperation with the private sector was going to be necessary, and would come at a cost of increased political clout. It’s doubtful that Correa himself could have done much about that; he even prepared the ground. The difference is that he doubtless would have dressed it up as heroic. The scandal related to the Brasilian company and its corrupt and corrupting practices has become a very big fly in a very big jar of ointment. The real issue here is probably Moreno’s lack of interest in playing Medvedev to Correa’s Putin. In response to the latter’s criticisms and, to be fair, his need to solidify his approval ratings and consequent ability to govern, he has hit back. In the process Moreno has distanced himself from ex-President and committed the heresy of suggesting that not all was bright and beautiful in the house that Correa built. By criticising the ex- president for his own political purposes, and also due to genuine disagreement, Moreno may have seriously compromised the chances of the ex-president successfully running again in 2021. Correa, and those political allies who would benefit by his return, are not at all happy about the criticism, to say the least. This is speculation of course, but to be honest it’s hard to find another plausible reason for the outpouring of hostility by Gabriela Rivadeneira and Marcela Aguiñaga: respectively Ex-President and Vice President of the National Assembly. Then there’s that word. Odebrecht. And sticking to animal metaphors, the scandal related to the Brasilian company and its corrupt and corrupting practices has become a very big fly in a very big jar of ointment. Keeping the lid on corruption scandals in Ecuador over the last ten years has been possible by means of threats and promises. Only rumours survived the pressure. Correa and Glas were even said to have been involved in a punch up over Glas’s corruption. But who knew for certain if it was true? It was just a rumour. But Odebrecht is not a rumour, it’s something else entirely: an international scandal in which international actors have an interest in making sure the lid stays open. The very sound of the word must send shivers down the spines of many of the faithful. Two past ministers have fallen and now the noose is slowly tightening around the neck of the Vice President, Jorge Glas and his uncle Ricardo Rivera who appears to be the linchpin. Recordings made by José Conceição Santos, previous Odebrecht representative in Ecuador, of conversations between himself and the State Comptroller Carlos Polit, presently out of the country and unlikely to return, mention Glas as asking for money for all Odebrecht contracts. The pieces are beginning to fit together. To complicate matters there are other cases of corruption that appear to implicate the Vice President. Up to now the Correa-Glas supporters seems to believe that just stating their support for Glas and blaming everything on a campaign to discredit him will make everything go away. But it won’t. Denial will only make things worse. The Vice president, almost certainly aware that Lenin Moreno was on the point of stripping him of his functions, attacked him in an open letter, which of course made the demotion even more certain. Denying everything has been Glas’ chosen tactic, and while it is a fact that no hard evidence has yet been found, as Moreno has recently said, the finger is pointing in his direction. And it’s a really big finger. The Attorney General is under pressure to formulate charges, but to subject Glas to criminal proceedings or destitution the National Assembly would have to give the green light. That only appears possible if the Vice President’s own party approves. If it does, the Correa faithful will be put in an extremely awkward position, if, on the other hand, it does not, the whole structure, President Moreno aside, will suffer a major blow to a credibility which is already creaking under the strain. As one local commentator stated, cynicism will become the party’s byword. Whether Glas is guilty or not, and it would be hard to find a dozen people outside the Alianza País structure who think he isn’t, the major question is why Rafael Correa insisted on forcing the now Vice President onto the electoral ticket. Glas was a clear liability for the campaign, and Moreno would probably have won handily with another running mate. So why do it? Why insist against the wishes of many of his own people, including Moreno, who in the early stages supposedly refused to run if Glas was on the ticket. Shooting yourself in the foot is one thing, pointing the gun at your head is quite another. According to one theory, the plan was to find a way to get rid of Moreno so that as Vice President Glas could take a step upwards; another implied that a way would be found to install José Serrano, the actual President of the National Assembly and previously Minister of the Interior in the Correa government. Both ideas sounded somewhat plausible, but whatever the reality, the first is now impossible and the second unlikely given that Serrano appears to be clearly in Moreno’s camp. It is now evident that insisting on Glas, and continuing to do so in the face of the recent revelations, has in fact turned out to be the shot in the foot that many imagined it would be. The outcome could be a disaster for Alianza País, and involve a major reconfiguration of the political scene. Calls are being made for unity with the party, but unless agreement involves allowing Glas to be processed, little or nothing will be gained. Shooting yourself in the foot is one thing, pointing the gun at your head is quite another.